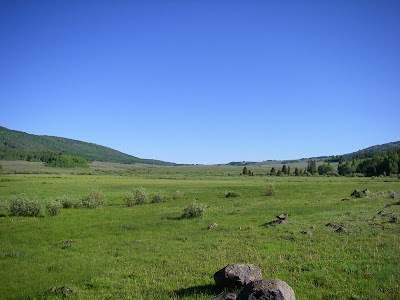 Just south of the town of Salina, Utah and the surrounding stretch of I-70 is an area known as the Fish Lake Plateau. 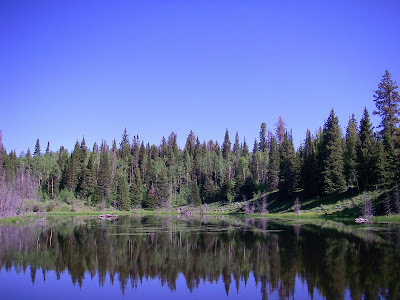 Since Fish Lake itself is a lake of legend, the other, smaller waters in the region tend to get overlooked by most. 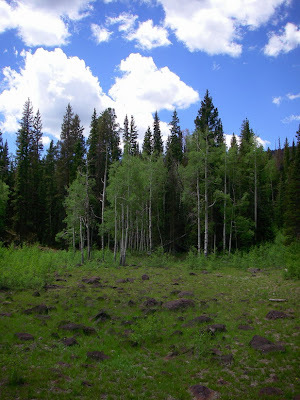 This is truly beautiful country ranging from sage and juniper to huge aspen forests and tall pines. Everything in between is absolutely breathtaking and very exciting to explore. From Salina, east on I-70, the first exit is the Gooseberry Road exit. This is a great road that provides access to much of the plateau's fishing grounds. After the pavement ends, the improved gravel road winds its way up the plateau to over 10,500 feet in elevation at the summit. Eventually, the road merges with HWY 25 at the north end of Johnson Valley Reservoir. 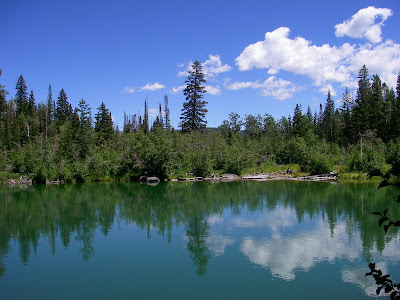 Just a few short miles away is the very popular Fish Lake. 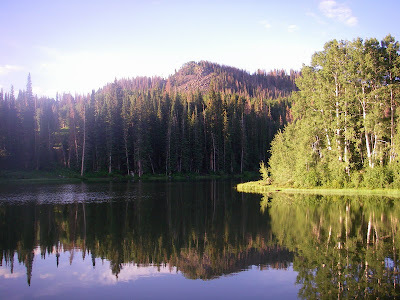 The first and lowest lake along the route (heading south) is Rex Reservoir. From Gooseberry Road, follow the signs to the west and up the hill for a few miles. The road is suitable for a passenger car when dry, if needs be. Do NOT attempt this road when it's wet. The mud and clay will give even 4x4's a run for their money. An alternate route is to come in from the west via Hwy 24, just north of Sigurd. "Lost Creek Road" is much better, but can also get gooey in the rain. If you choose to take this route, be sure to hit the creek while you're at it. 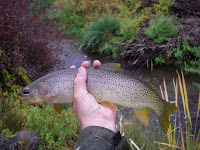 It's a really fun stream and the browns are aggressive to chase down a fly/lure. Mind the scrub because it gets pretty tight in spots. Rex gets hit pretty hard on the weekends by the locals, but it's still a great lake to float and fish. 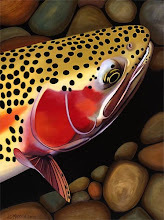 The stocked rainbows and a wild population of cutthroat and brown trout can provide a very good time on the water. 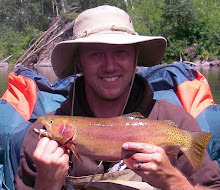 The rainbows grow quickly, but tend to be the easiest fish to catch and don't always last very long. 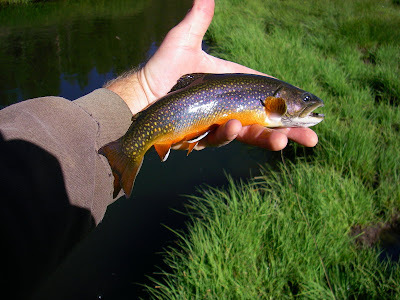 There's always a healthy number of cutts, and even some browns that are rumored to grow up to 4lbs. The water level can fluctuate pretty heavily every year, but it seems that a sufficient amount remains to winter the fish. I've fished it full and I've fished it nearly empty and the fishing has been best in the fall. In the spring, the surface area is twice that of fall or maybe even more. There's a great difference from one season to the next. The springtime runoff clouds up the water horribly. 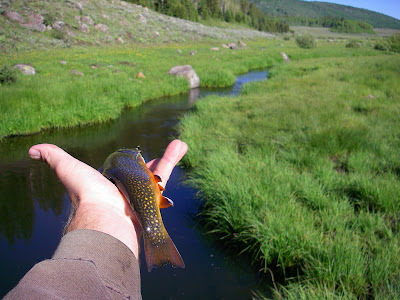 Fish can be caught, but the reservoir fills up to the point of submerging the surrounding juniper and accessing the chocolate brown water is difficult. I've had the best luck with a Black #2 Blue Fox Vibrax, but a variety of lures will produce well. Worms and powerbait are popular with the locals. A Gulp minnow on a 1/16oz jig head is sure to keep you bent as well. For flies, I've done best with black leech/bugger patterns. The photos above and below show an area with a lot of structure for the fish to hide in, especially predators. This is where I tend to focus my efforts from the tube. There are many ATV and Jeep trails cutting off in all directions from Rex, but most are gated. It's too bad because there's more water on that hill that looks inviting. Continuing south, the landscape will transform from sage and junipers, to aspens and pines. Gooseberry Creek runs along side of the road in places and can offer some beautiful little rainbows and possibly cutts, brookies, and browns as well. 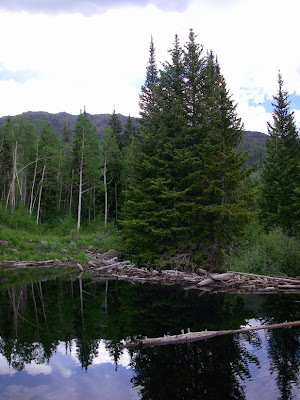 Some beaver ponds are also found within a short (but bushy) hike from the roadway. Some of these hold fish and some don't. They all end up flowing into the creek at some point. Making your way farther up the hill brings you around a few bends and a small sign will appear on the right that reads Twin Ponds. A short spur road leads to several nice camping areas (primitive) and terminates at a closed gate with space for several vehicles to park. Only about a 1/4 mile hike from the gate/trail head lies Twin Ponds. Two ponds divided by a strip of land make up this pretty little venue full of brook trout and some rumored trophies. Depending on the water levels, this can be a solid, horseshoe shaped lake or two kidney-shaped ponds. 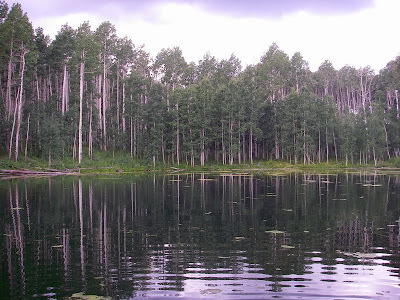 Nestled in a pocket of huge aspen trees, the ponds are usually pretty calm and relaxing to fish. Marabou jigs are very effective, as well as leech patterns. A worm resting on the bottom can also keep the line tight. The western-most pond is the deepest of the two. Fishing from shore is the norm at these ponds, but a float tube can provide a much better opportunity to give a good presentation to the fish. 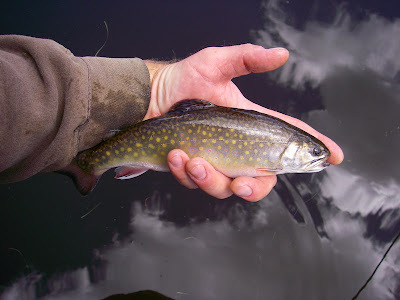 Most of these brookies are relatively small, although I've seen a few that were quite nice, even up to a thick 16 inches. The local wildlife also likes to drop in for a visit. 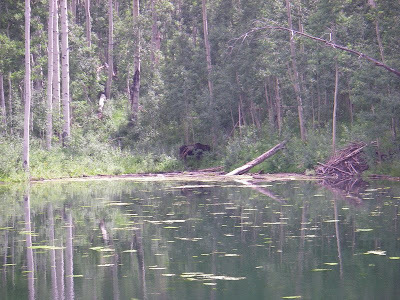 Caught this moose having a drink at the inlet, during my first visit. It's rare that the fishing is slow at Twin, but if that's the case, more water is in basically every direction and the fish within can be quite nice if you know where to look. 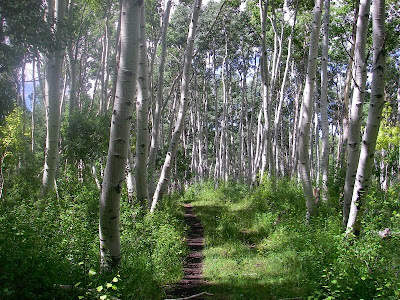 No matter what is happening, fish-wise, a gentle stroll under a canopy of aspens is never a waste of time. 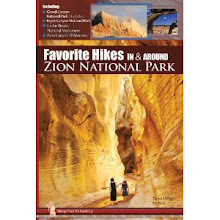 This is an extremely pleasant area to spend time hiking and exploring. 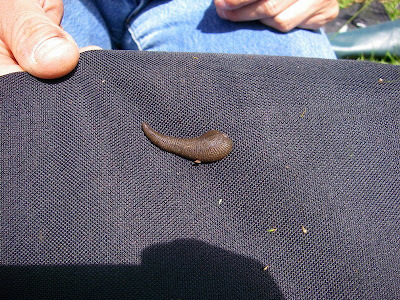 Leeches are present in much of the water and mimicking patterns should be effective. 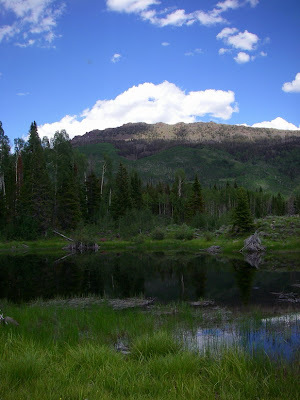 Making your way into one of the more secluded lakes can offer placid solitude and sweet rewards. A magical area, it is. Exploring the Fish Lake Plateau has taken me to incredible places and serene states of mind while pursuing its colorful inhabitants. Cold Springs Pond is just up the road from Twin Ponds, at the end of its own spur road. It's quite popular, being only a short walk down a hill, and the fish are typically small stocked rainbows. I hear there are some brookies in there as well. Pretty little lake, that's for sure. Another nearby lake is Farnsworth Reservoir. It also receives a fair amount of pressure, but some rather decent fish are also present, among the hatchery pets. Stocked quite heavily with rainbow trout, brookies are also found here and can be caught occasionally. It's a nice place to be, first thing in the morning. Directly south of Farnsworth is Harves River Reservoir. This is a smaller reservoir that has a lot of small brookies in it. The product of successful recruitment without many predators to add balance, they have overpopulated. Following the trail from the dam at Farnsworth, you climb higher up the mountain to a small lake surrounded by pines and grasses. From the dam, a great view of the valley can be seen sprawling into the distance. 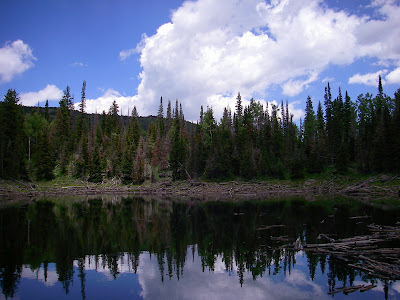 The hike to this lake is only about a mile or so from Farnsworth and packing a float tube would be a great idea. Stocked with a small number of brook trout annually, some say there are trophies swimming around. 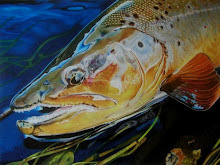 Most fish are between 10 and 14 inches in length and I have seen no evidence of said trophies. That doesn't mean they're not in there though. From shore, fish can be caught by moving around frequently. Fishing here can be very streaky with fast action for a few minutes and then nothing for an hour or more. The key is to keep moving. It's not a big lake and covering as much water as possible will produce more bites. 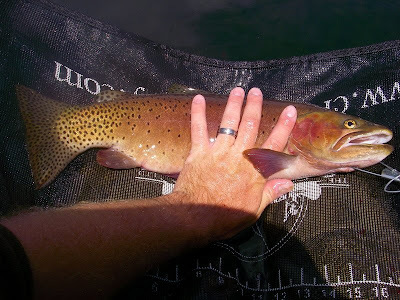 Salina Reservoir is a bit farther up the road and has planted rainbows and likely some brookies as well. 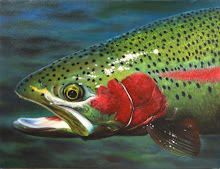 My own experiences have provided 13 inch rainbows with rubbed-off fins. 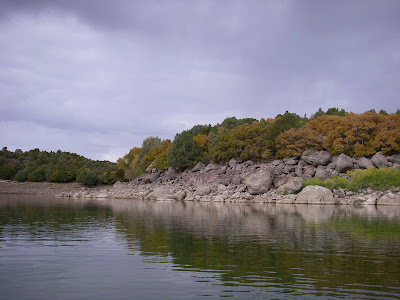 There are some small ponds in the vicinity of Salina Res that may or may not hold fish, depending on the year. 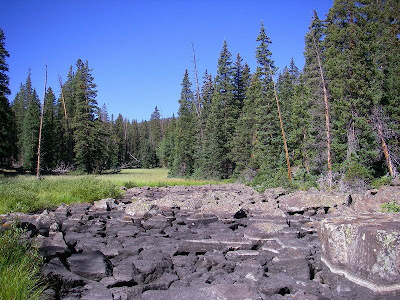 Upstream is a marshy and rocky group of beaver ponds and basins that are a really rough hike through tight stands of pine, underbrush, and fallen timber. Some friends of mine have attempted to fish them and claim that they are lifeless, however, those types of places can be deceiving. One day I'll get back there to check for myself. Another little pond in the area is called Crater Lake. It's a tiny pond with ice cold emerald colored water, small brookies, and it's somewhat deep for its size. The inlet and outlet are sub-surface, likely filtering through the igneous rocks which hold it. Gorgeous little spot, but nothing to plan a day around. Gates Pond is another lake that is somewhat "nearby". An access road (FS40) just past the 10,500ft summit of Gooseberry Road cuts west and eventually drops down to Gates. The road isn't great, but it didn't stop me from making it in a Sentra. Don't take your Audi though. If it's wet, make sure you take a 4x4. The fish in Gates are mostly planted rainbows with nubby fins, but it holds a few surprises as well. 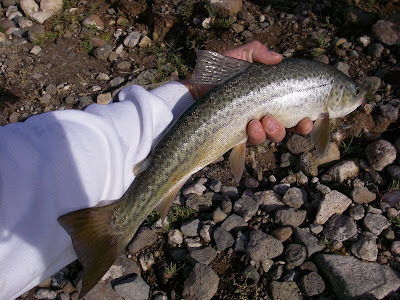 Tiger trout are also stocked from time to time and they can grow to decent sizes. 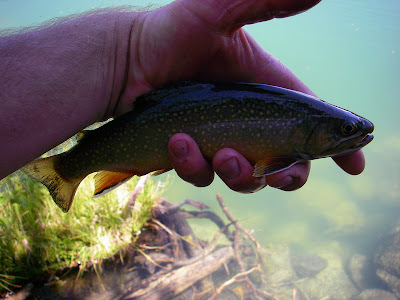 Brookies are also rumored to swim this water and I've even caught a brown trout, of all things! Not exactly what I was expecting at nearly 9800ft. 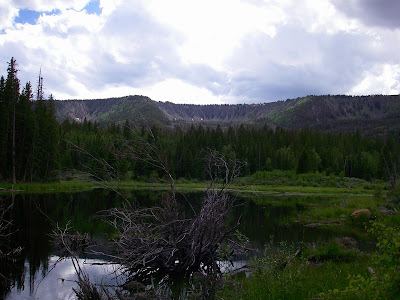 There are numerous beaver ponds dotting the hillsides along the way to Gates. Some of them are loaded with fish, others are not. Some of my exploration has been rather fruitful and I recommend taking a hike. 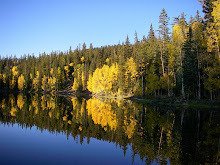 Lost Creek Reservoir is the next significant water body along Gooseberry Road. 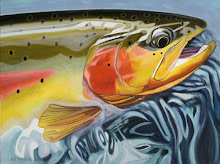 Several attempts have been made to turn it into a cutthroat fishery, but all the information I can gather leads me to believe that those efforts have failed. 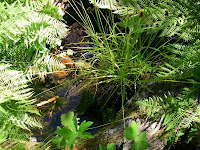 The water level fluctuates a great deal and dissolved oxygen may become scarce at low pool. All of my visits have left me catching nothing but large salamanders, which flourish. Perhaps they are the culprits behind the failed stocking of this and other reservoirs in the region. If a big salamander can wolf down a nightcrawler, it would be plausible that they could also consume fingerling trout. They are carnivorous. Something inside me still thinks there could be a few hog fish in this lake, despite the aforementioned obstacles. If a fish were able to survive long enough to grow a few inches, the forage is plentiful. Anything over 10 inches could likely experience rapid growth with those salamanders on the menu. It's an interesting situation and I hope that one day, I can catch fish from it. 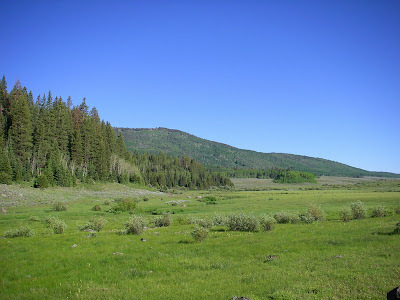 Just south of Lost Creek Res the headwaters of 7-Mile Creek spill into each other to create a beautiful stream that runs through the grassy meadows, providing a population of wild brook trout. The surrounding valley is seems as though it is always lush and green (when it's not under a few feet of snow). At an elevation above 9,000+ feet, the summertime temperatures are quite comfortable here and camping can be had with little sacrifice. Undercut banks, deep bends, and grassy edges provide a lot of habitat where the fish may hold and catching them can be pretty easy with the right bug. An orange scud pattern has worked well for me. The rich hues of these brookies can brighten up anyone's day. 7-Mile Creek is a pristine gem worth visiting over and over. Studying the satellite maps in the area is a good idea and can shed light on the many ponds that hide all over the densely forested hills. A couple of these ponds are stocked by airplane, but most rely on natural reproduction, if they hold any fish at all. Bringing a GPS with preset waypoints would be wise, as it is quite easy to become disoriented in the thick trees. Without a GPS, Mount Marvine can serve as the eastern post of the mental compass. Marvine can be seen from most clearings, being the highest visible peak in the vicinity. 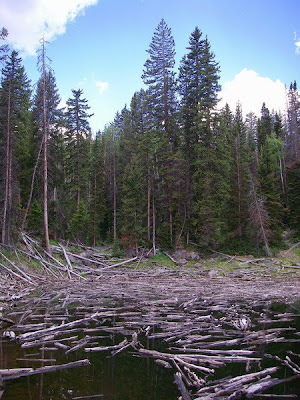 Hiking along the path of any drainage could lead to beaver dams and other ponds. 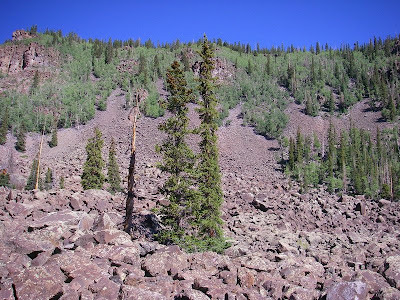 High cirques of over 11,000ft outline the western rim of this valley. Nice fish live in a few of these waters, but require a bit of work to find. 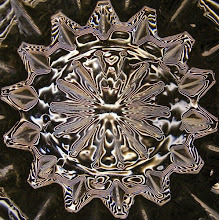 Most waters seem fishless and very well may be, but others hold surprises. Some lakes will trick you into believing there are fish, but the "fish" turn out to be salamanders. Some of the waters can be very tough to fish, but getting around the obstacles can be rewarding. Ranger Lake (below) is very hard to find, even with a GPS and is full of smaller brookies. 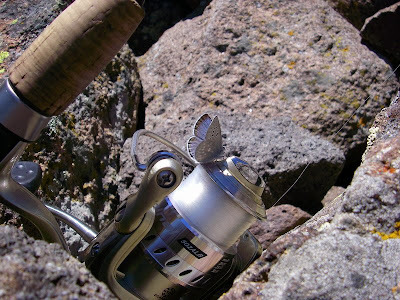 The catching can be nice and fast-paced, but better fishing lies lower on the same hill in the ponds. 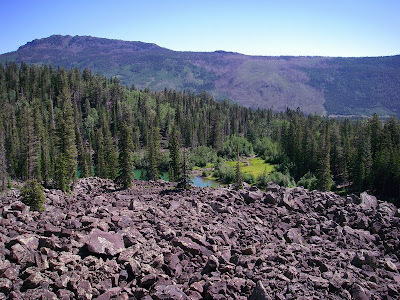 Volcanic rock makes up most of the geology and can be seen pretty much anywhere, sticking out of the soil. 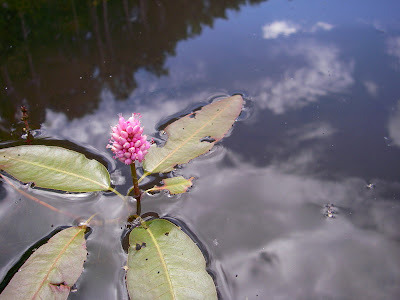 Even when a pond seems to be lacking in fish, a little persistence could prove otherwise. I sat at this pond for over an hour before seeing any signs of life. After catching that one, something much bigger spooked from the bank behind me, leaving a wake on the surface. A return visit provided myself and my friend with incredible fishing for healthy brookies up to 18". Unfortunately, the dam breached on that beaver pond and it no longer holds any fish. The whole area is full of water worth exploring. The early bird gets the worm in these shallow pools. 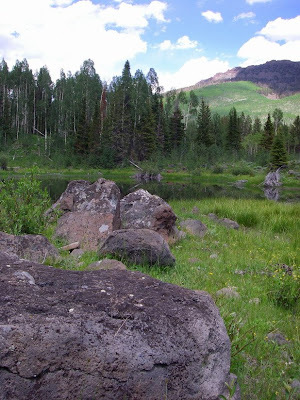 This beautiful, secluded lake is nestled back against the base of an ancient volcanic rock slide, with the trail head only about a mile north of Johnson Valley Reservoir. The trail head is hard to notice, but will be on the west side of the road (right side, headed south). 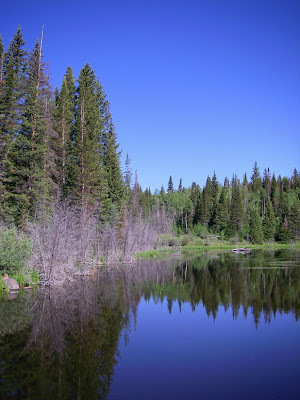 The trail follows the path of Tasha Creek and the numerous beaver ponds can be a real distraction. Some of these ponds hold fish and some of those fish can be pretty nice. Although bringing a GPS isn't imperative, it couldn't hurt. The tall pines and thick bush block the view of major landmarks (ie: the mountainside) and getting lost is easy. My first trip to Aberdunk ended up taking a couple of hours longer than it should have, since I missed the side trial to the lake. 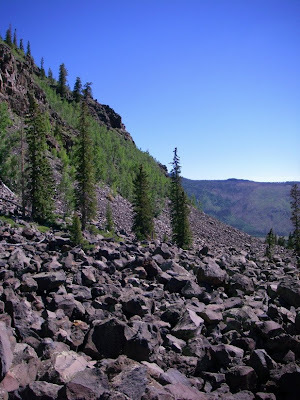 Instead, I kept marching my way up the canyon and eventually to the base of the rock slide, halfway across the mountain. The trail cuts off to the right (north) of a creek bed, shortly after some switchbacks. 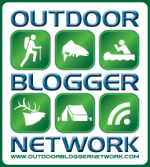 Don't miss this trail and watch for possible ribbon markers on trees at the creek bed. I believe one of the trees actually has the word "lake" carved into it. Without this trail, getting to the other side of the canyon can be a grueling romp through the dense vegetation and fallen timber. There's no shortage of beauty and wonder around here, no matter where you end up though. Knowing I had traveled too far on my first trip, I had to stay close to landmarks that I recognized from my map-hounding prior to the trip. This meant following the rock slide to its eastern base, where the lake lies. 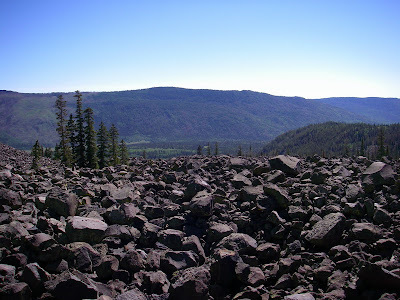 Make no mistake, this rock slide is more like a giant boulder field that can be brutal to the joints of its hikers, especially when weighed down with gear like I was. The tranquility of knowing I was the only human around allowed me to take in the scenery and enjoy my strenuous detour, regardless of the toll my body had to pay for it. 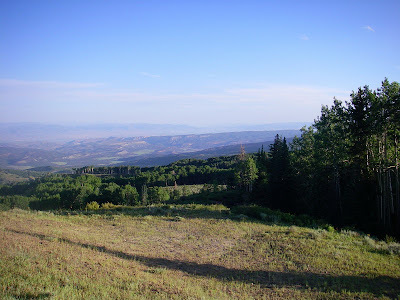 After spending about an hour and a half hopping from boulder to boulder in direct sunlight on a hot summer day, I was elated to finally see the target of my adventure, glimmering below. Though the water was beckoning and fish were visible swimming all around, I didn't even attempt to fish until I'd taken a long rest in the shade. As can be imagined, my time resting was spent fondly enjoying the spectacles of my surroundings. 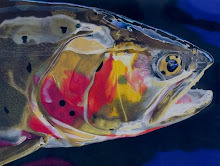 Once I started fishing, I realized that the larger fish in the pond were large for a reason, as I could only coax them to follow my lures. The smaller fish, however, were very willing to take almost anything I offered, including this brookie, who bit a bare hook right in front of me. It was a very enjoyable experience to visit this lake and the area surrounding it. It's only a matter of time until the stocked tiger trout balance out the brookie population and a really nice fishery could be the result. This is the last body of water along Gooseberry Road before it merges with Highway 25, which runs along the shores of Johnson Valley Reservoir and Fish Lake, itself. 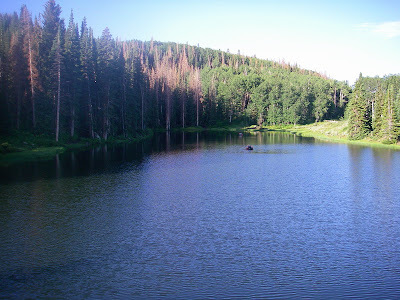 This deep, natural lake sits at nearly 9,000 feet in elevation and is the busiest fishing water in the region. 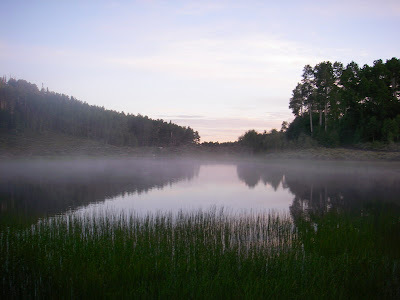 My personal experiences at this famous lake are very limited, since most trips to this area have been spent researching the smaller, lesser-known waters in the vicinity. The times I have visited have been bitter-sweet. 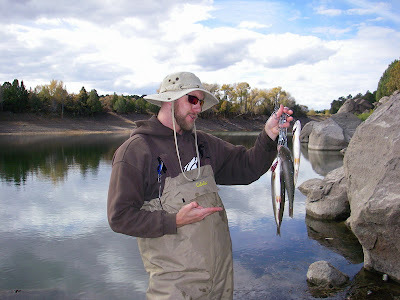 My first two trips to the lake only yielded 1 hatchery rainbow per outing. 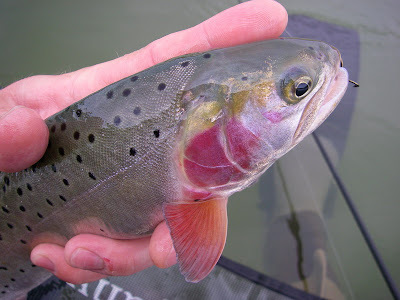 A quick stop on my way home from other waters provided a small brown trout once, and my last visit was only for about an hour, catching quite a few aggressive rainbows and a hideous lake trout that looked as though it spent most of its life in a concrete hatchery run. That last trip was an opportune stop to fish the open window of water around Twin Creek, while the rest of the lake was frozen. Fish Lake is famous for it's trophy sized Lake Trout (Mackinaw) into the 40's of pounds, though the 10-20lb range is more common. Other species include rainbow trout, splake, brown trout, perch, and even tiger muskellunge that have swum in from Johnson, only a few short miles away. Rough fish include chubs, suckers, and carp. My hunch is that brookies are also present in the lake, though reports of catching (or targeting) any are lacking. 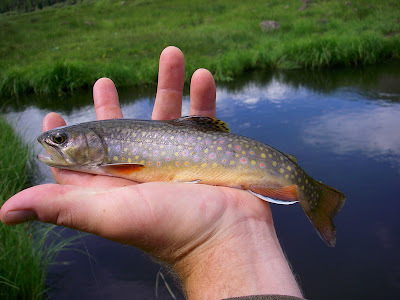 With 7 Mile Creek flowing into Johnson Valley Reservoir, and Fish Lake just upstream, I am convinced that some thug brookies live in Fish Lake. Fishing from shore is possible, but there is a thick weedline that circles most of the lake, which can be hard to deal with. 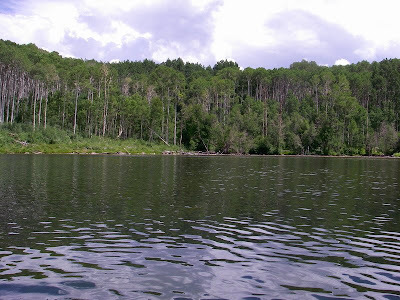 It is generally known that fishing from a boat here will give the angler a much better advantage. The edge of the weedline is also well known for being a great place to catch fish, as they tend to school in large numbers. Rainbows, perch, and the odd splake are the main catches at the edge, although I've heard fish tales of large tiger muskies lurking about as well. The splake can be caught almost anywhere, at almost any depth throughout the lake. They'll readily take jigs tipped with fish meat (sucker, chub, perch), bright spoons, or even pop gear. The lakers are notoriously tough to catch, but are strong in numbers. Many macs will be significantly smaller than 10 lbs (known locally as "pups"), but the hogs exist and are taken with some frequency every year. 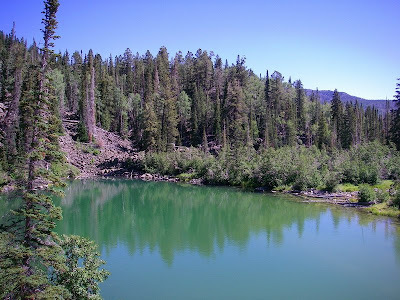 If I can ever talk myself out of fishing the smaller waters nearby, Fish Lake could easily become a new obsession, as it is with a great number of anglers from every corner of the state and abroad. 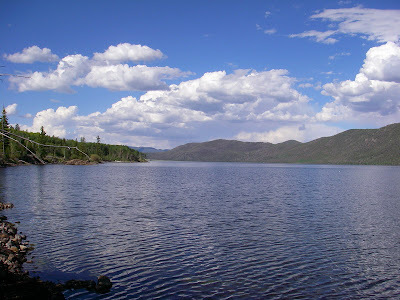 Forsyth is located southeast of Fish Lake and Johnson Reservoir, just off Hwy 72. 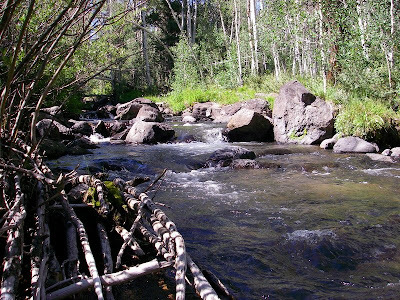 It's fed by UM Creek, which boasts excellent fishing for Colorado River Cutthroat Trout and tiger trout, farther upstream. The reservoir drains into its close neighbor, Mill Meadow Reservoir to the immediate west. 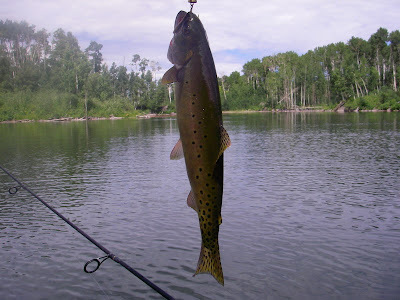 Likely catches at Forsyth are tiger and splake trout, but rainbows, cutthroat, and browns could also find their way onto a hook. The water level can fluctuate a great deal in a year's time and when sufficient levels are maintained, the fishing can be very good for nice fish. Mill Meadow is just to the west and offers browns, splake, tiger trout, rainbow, cutthroat, perch, and even tiger muskie, on occasion. Having never fished there, I can't give out much info about it. This concludes our little tour of my favorite area of the state to fish. Thanks for reading. Good stuff, here Justin! Thanks! 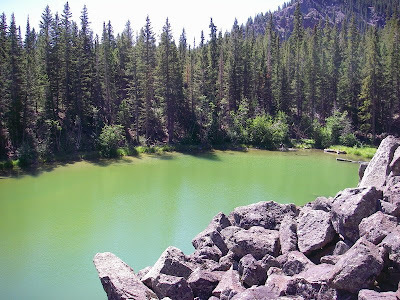 I have fished that area (Fish Lake) alot,we used to spend at least 2 weeks a year there.As I have gotten older the fishing bug has kind of wained,and with my wife having a knee replacement our hiking is limited to how far I can carry her. (not really,she tries,but cant take the hills anymore. 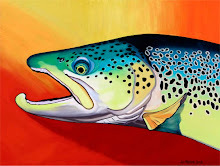 )and I wont leave her home cause she loves to fish.Nice blog,and you have lit a fire in me to get out and see if I remember how to catch um.Thanks for all the insite and your great writing skills.You now me as Dunkem.Thanks Brad Duncan.